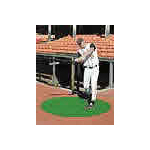 Our turf halo kits are designed to replace the area around home plate to protect against heavy impact and wear. Traditionally, this area has tremendous traffic and grass has difficulty growing. Our halo kits are designed per the standard baseball field layout – 13’ radius from the back point of home plate. Total height with foam: 3/4"
All of our halos use a high quality, spike-resistant 42 oz. nylon surface over an all-weather 5 mm foam pad for shock-absorption and added density, and also include UV Inhibitors. All Logos are In-Laid. This means the logo itself is made of colored turf, embedded into the mat - instead of just applied to the surface like paint. These logos will last until the turf itself wears out - approximately 10-20 years depending on exposure. Save approximately 15% on the cost of your letters by ordering them "NOT GLUED". You will receive the letters as individual pieces, which fit perfectly into the pre-cut areas on the halo. You will simply insert like a giant puzzle during installation, and glue to your concrete. Ordering the letters pre-glued at the factory is not required, because you will also apply glue to the bottom of the letters during installation to keep secure - so this eliminates a redundant step & saves you money! *It's still recommended to order detailed Logos GLUED, which will ensure all of the intricate pieces/colors fit together just right. Some logos can have small sections of colored turf, so it's easier to have these pre-installed into your halo. Your concrete pad should have NO cracks or open joints. Easily fill in any joints with 'mortar powder' to create a smooth surface. Look for all-weather urethane compatible adhesive. Start bender board forms at 3 ft from foul line and pour concrete at 5 or 10 feet accordingly. POUR EXACTLY 5 OR 10 FEET TO PREVENT TRIMMING. Concrete needs to be 4 - 6 inches deep with adequate structural support to accomodate climate changes. Let concrete cure a minimum of 14 days. Moisture will ruin glue if concrete is not fully cured. Match pieces to fit diagram and weigh down center piece in place. Use heavy weight to make sure turf lies perfectly still. Then proceed to fold one half-section up at a time for glue application. Glue each one-half section at a time, using 50 - 100 pound rollers to roll out each section for proper adhesive bond. Repeat steps 6 and 7 for each section. Make sure glue has at least 24 hours to dry by covering with plastic or a field cover. NOTE: Halo with wings can be modified to be 5 or 10 feet long. The wings run along the baseline, not in the baseline. Thank you guys so much for the work you did on our suspended batting cage system, it has been awesome. I have attached some photos of the cage and area. It looks and works great. It has been greatly used this COLD and wet spring!